Singer. Rebel. Outlaw. Hero. With his driving freight-train chords, steel-eyed intensity and a voice as dark as the night, the legendary Man in Black revolutionized musicand forged his legacy as a genuine American icon. Golden Globe winners Joaquin Phoenix and Reese Witherspoon star (and sing) as Johnny Cash and June Carter in this inspiring true story of one mans unwavering devotion to his sound, his message and the greatest love of his life. $22.347 million on 2961 screens. In 2004, Ray looked at the life and career of a music pioneer whose career peaked in the Fifties and Sixties. In 2005, Walk the Line looked at the life and career of a music pioneer whose career peaked in the Fifties and Sixties. 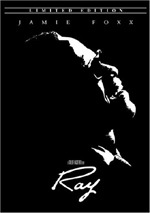 Both received similar attention from critics and the Oscar nominations, though Ray managed a Best Picture nod that eluded Line. At least Line could boast better box office returns, as it made $116 million as opposed to Ray’s $75 million. Comparisons between the two films seem valid because they’re so similar in so many ways. It’s not just their subject matter that makes them appear alike. Both flicks take on their topics in nearly identical manners and often feel like companion pieces. Line examines the ups and downs of seminal country star Johnny Cash. After a brief look at his famous Folsom Prison concert in 1968, the movie immediately leaps back to Cash’s childhood in Arkansas. Set in 1944, we meet young “JR” (Ridge Canipe) and his family. They include best pal/older brother Jack (Lucas Till) and abusive father Ray (Robert Patrick). They live a poor existence as cotton pickers and Jack does some work on the side. When he has an accident at a power saw, he soon dies. From there the movie leaps ahead to 1953 and an adult John’s (Joaquin Phoenix) induction into the Air Force. He goes to Germany where he writes some of his earliest songs. When he returns to the US, he marries his sweetheart Vivian (Ginnifer Goodwin) and takes her to Memphis so he can become a musician. Unfortunately, he does poorly and they live in poverty until he gets his big break. John and his band audition for Sun Records owner/producer Sam Phillips (Dallas Roberts). Initially Phillips rejects their warmed-over gospel, but when John trots out his own tunes, he wins himself a record contract and a spot on the Sun Records concert tour. There he finds himself onstage along with Jerry Lee Lewis (Waylon Malloy Payne), Roy Orbison (Johnathan Rice), Elvis Presley (Tyler Hilton) and June Carter (Reese Witherspoon). John mooned over June as a child, and even though both are now married with their own kids, he clearly maintains a romantic interest in her. That theme continues through the years. June divorces and remarries while Johnny experiences his own marital difficulties, largely due to his ongoing love for June. It doesn’t help that Cash becomes a pill-popper and drunk along the way; those factors take their toll on his career as well. Line follows Cash’s life and career until 1970 as we watch Johnny’s ups and downs. As I alluded earlier, Line shares an awful lot of similarities with Ray. In fact, the two films are so much alike that I’m damned tempted to simply cut and paste my remarks about Ray for this review. I don’t know what I said about Ray that also doesn’t apply to Line. Actually, that’s not totally true, as I think Line boasts a stronger focus. It concentrates on Johnny’s love for June. That’s a consistent theme throughout the flick, and it’s not a coincidence that the movie ends right after she finally accepts his marriage proposal. Johnny’s feelings toward her give the story more of an arc than Ray enjoyed. And June offers a strong female character absent from Ray. The women come and go in the latter; they make a dent but don’t offer as compelling a part. Too bad that Line doesn’t give June a whole lot to do other than act as the object of Johnny’s affection. Really, she’s the Jiminy Cricket role, as she works to clean up Cash and redeem him. Witherspoon manages to open up the part as well as she can, but as written, she’s kind of a nag and doesn’t get much dimensionality. To a certain degree, the film hamstrings Johnny in the same way. The script doesn’t give him a lot of depth and we don’t receive much exploration of his character. Take the segment in which he gets addicted to drugs. This just happens; one minute he’s clean, and the next he’s hepped up on goofballs. I suppose his fruitless passion for June explains some of this, but that’s speculation since the movie fails to investigate this. I don’t see Phoenix’s performance as a terrific one, but again, I think he does the best he can. The script simply doesn’t allow him much leeway. It gives him a few specific characteristics but doesn’t open up matters to greater interpretation or depth. Phoenix works his way through the superficial nature of things well but he can’t overcome the limited depth of the story. Some have criticized the decision to have Phoenix and Witherspoon sing for themselves. Neither can replicate their characters’ voices with true accuracy, so this could become a bit of a distraction; if the singing doesn’t match with our memories of Cash and Carter, we could lose touch with the film. In my opinion, Witherspoon and Phoenix approximate June and Johnny well enough to succeed. It’s less of a problem for Witherspoon since fewer people boast great familiarity with June’s voice. Phoenix never really emulates Johnny, but he feels close enough for my liking. Although Ray’s use of Ray Charles’ actual vocals meant this wasn’t an issue, I prefer the choice in Line because it makes the musical sequences more seamless. I recognize that Witherspoon and Phoenix lip-synch their own tunes here, but I find that technique to be more convincing when someone mimics their own vocals. This seems more natural to me than the karaoke treatment, so the musical pieces match better than I think they would if they used old Cash and Carter recordings. At least Line comes across less as a “greatest hits” reel than Ray. That’s due to the emphasis on June. We see some of Cash’s big moments but the movie doesn’t simply toss them at us in a haphazard way. It manages to integrate them fairly well, even if few of them stand out as particularly memorable. Ultimately, Walk the Line comes down as a perfectly respectable and reasonably entertaining bio-pic. At no point does it become less than interesting, but it never threatens to turn into anything truly magnetic or involving either. This is decent stuff and nothing more. Note that this release of Walk the Line provides an “Extended Cut” of the film. Essentially this takes about 18 minutes of deleted scenes from the 2006 DVD and reinserts them into the action. Some of these are more interesting than others – I always liked the sequence in which Cash freaks after he breaks a test record – but they don’t make much difference for the overall package. The movie works the same way in either 135 minute or 153 minute incarnations. 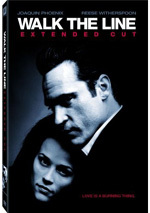 Walk the Line appears in an aspect ratio of approximately 2.39:1 on this single-sided, double-layered DVD; the image has been enhanced for 16X9 televisions. The presentation had a few problems but it usually offered solid visuals. My only real complaints related to sharpness. Some moderate edge enhancement affected the movie’s definition, and that created looser wide shots than I expected. The rest of the transfer seemed concise and accurate, though. I noticed no issues with jagged edges or shimmering, and source flaws appeared absent. Line took on a nostalgic, somewhat golden palette much of the time. It rendered its colors with fine vivacity and presence. The hues were always firm and lively. Black levels seemed rich and dense, while low-light shots offered nice delineation. Other than the occasional soft image, the presentation appeared positive. When I examined the audio of Walk the Line, I found both Dolby Digital 5.1 and DTS 5.1 soundtracks. If any significant variations differentiated the pair, I couldn’t discern them. I thought both mixes sounded very similar. And that was fine with me, as the pair offered high-quality audio. As one might expect, music dominated the presentations. All the various tunes offered excellent stereo imaging as they spread instruments accurately across the front. Surrounds offered neat support for the music as well, though the songs focused on the front. Effects didn’t play much of a role, but they worked fine. Some thunder and audience bits added good atmospheric material. Audio quality was solid. Speech always sounded crisp and natural, and no problems marred the dialogue. Effects seemed tight and accurate, while music was full and dynamic. The songs presented distinctive highs and warm lows. Overall, these soundtracks gave us clear, vivid audio. How did the picture and audio of this “Extended Version” of Walk the Line compare to those of the original theatrical DVD from 2006? I thought both were virtually identical. Don’t expect to see any changes in terms of visuals or sound here. The 2008 DVD offers a mix of extras. Also found on the prior disc, Disc One includes an audio commentary from director James Mangold. He offers a running, screen-specific discussion. Mangold chats about the story and characters, actors and performances, sets and period issues, his relationship and collaboration with the real Johnny and June, and a mix of general production topics. We get info about why Mangold chose to have the actors sing their own songs and many other bits connected to the music. This was the fourth Mangold commentary I’d screened and arguably the best. Substantially more introspective than the usual discussion, Mangold offers a lot more about why he did things than how. He delves into historical and character subjects with real fervor and offers very good elaboration of the film’s themes and material. I especially like the notes about his time with Johnny and June, but Mangold makes almost every moment worthwhile here. He provides a genuinely informative and thoughtful look at his film that acts as a terrific companion piece. Over on DVD Two, we start with the Johnny Cash Jukebox: Extended Musical Sequences. Here we find eight tunes that run a total of 26 minutes, 50 seconds. (That includes optional introductions; if you just select the songs, the compilation fills 16 minutes, 36 seconds.) We can check out “Lewis Boogie” (Waylon Paine as Jerry Lee Lewis), “Get Rhythm” (Joaquin Phoenix as Johnny Cash), “You’re My Baby” (Johnathan Rice as Roy Orbison), “Jukebox Blues” (Reese Witherspoon as June Carter), “Rock and Roll Ruby” (Phoenix), “That’s Alright Mama” (Tyler Hilton as Elvis Presley), “Jackson” (Phoenix and Witherspoon) and “Cocaine Blues” (Phoenix). These provide longer versions of songs found in the movie. They’re moderately interesting but not particularly fascinating. During the intros, we get comments from Mangold, Rolling Stone contributing editors Steve Pond and Mikal Gilmore, Johnny Cash record producer Jack “Cowboy” Clement, Rolling Stone managing editor Jason Fine, son John Carter Cash, Rock ‘n’ Soul Museum curator John Doyle, producer James Keach, costume designer Arianne Phillips, Country Music Hall of Fame historian Jay Orr, Elvis’s guitarist Scotty Moore, biographer Patrick Carr, and actors Waylon Payne, Johnny Holiday, and Johnathan Rice. The participants discuss the musicians depicted in the film as well as the songs performed. We hear some night insights into the topics. Although the extended cut on DVD One includes 18 minutes of additional footage, we locate extra cut material in More Man In Black: Deleted Scenes. Two clips appear here: “Memphis Streets” (3:19) and “At the Bank” (3:12). These also showed up on the original DVD. Neither seems particularly interesting, and I guess those behind the Extended Cut agree since they didn’t bother to reinsert them into the longer version of the flick. We can view these with or without commentary from Mangold. He offers the usual notes about the scenes and why they were cut. Once again he proves informative and enjoyable here. From there, most of DVD Two provides featurettes. Becoming Cash/Becoming Carter runs 10 minutes, 55 seconds and features Mangold, producer Cathy Konrad, co-screenwriter Gill Dennis, John Carter Cash, composer/music supervisor T-Bone Burnett, cinematographer Phedon Papamichael and actors Robert Patrick, Reese Witherspoon, and Joaquin Phoenix. 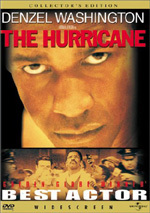 The program examines the casting of the flick’s two leads, aspects of those characters and the performances, the participation of the real Johnny and June in the movie, the use of music and attempts at realism. “Becoming” minimizes the happy talk side of things and digs into the leads pretty well. I especially like the info about the songs and how the filmmakers got the actors into musical shape. For the 11-minute and 53-second Sun Records and the Johnny Cash Sound, we hear from Clement, Pond, Doyle, Orr, Carr, Phoenix, Fine, Moore, Payne, Grand Ole Opry curator Brenda Colladay, Sun Studio chief engineer James Lott, Sun Studio general manager John Schorr, actors Larry Bagby and Dan John Miller, Sun Studio tour guide David Brookings, and musicians Kris Kristofferson, Chris Isaak, Robert Earl Keen, Henry Rollins and Marty Stuart. The program looks at the Memphis music scene in the 1950s, the origins and development of Sun Records, the talent that recorded for Sun back at the time, and Cash’s music. We get a decent view of the facts behind the flick, with an especially positive glimpse of Cash’s sound. Folsom: Cash and the Comeback lasts 11 minutes, 46 seconds and provides remarks from Stuart, Carr, Pond, Kristofferson, Fine, Orr, Don and Harold Reid, Miller, Folsom recreation director “Coach” Lloyd Kelly, Folsom public information officer Lt. Robert Trujillo, and Folsom inmate EC Breland. “Folsom” looks at Cash’s affinity for the prison setting as well as his push toward a late 1960s comeback and the Folsom concert. The featurette provides good notes about this seminal performance and its elements. We take a look at the Carter/Cash relationship via Ring of Fire: The Passion of Johnny and June. It goes for 11 minutes, 28 seconds and involves John Carter Cash, Stuart, Nash, Don and Harold Reid, Fine, Carr, Orr, Pond, Miller, Phoenix, and Kristofferson. “Fire” covers the long-time connection between Cash and Carter as well as aspects of their personalities. Some of the information repeats from topics covered in the film, but we get enough new stories to make “Fire” interesting. Finally, Celebrating the Man in Black: The Making of Walk the Line runs 21 minutes, 37 seconds and features Nelson, Stuart, Rollins, John Carter Cash, Kristofferson, Haggard, Kid Rock, Witherspoon, Phoenix, Mellencamp, Mangold, Keach, Konrad, Burnett, Hilton, Rice, Payne, Clement, “Tennessee Two” bass player Marshall Grant, Cash’s manager Lou Robin, musician Rodney Crowell, and actors Dallas Roberts and Shooter Jennings. “Celebrating” offers a recap of the story and characters as well as some aspects of the flick’s shoot. Created as a televised infomercial, a few minor tidbits emerge, but this remains a highly promotional piece. A few Trailers finish DVD Two. We locate the theatrical ad for Walk the Line as well as promos for Once and Waitress. A short booklet provides a little text. 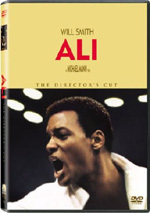 It provides short notes about the screenplay and the film’s lead actors. It’s not much, but it acts as a decent complement to the rest of the package. Chalk up Walk the Line as a moderate success. The movie offers a decent look at the ups and downs of Johnny Cash’s life and career, and it features consistently good performances. However, it lacks a certain spark or sense of depth that would make it more memorable. The DVD presents pretty positive picture and audio along with a very good collection of extras. I don’t think the extended version of the film improves it, but the supplements make this release a winner for fans.